Ancelotti gives advice to Sarri on how to deal with Abramovic's texts! Ancelotti gives advice to Sarri on how to deal with Abramovic’s texts! The current Chelsea boss has been receiving texts from Abramovic regarding Chelsea’s dip in recent games. Chelsea manager Maurizio Sarri is under fire. After the surprise defeat to Bournemouth, there’s been rumors of Chelsea hierarchy upset with him. The surprising comment of unable to motivate the players alongside having personal talk with player sans staff has led to Chelsea owner Abramovic texting the Italian. 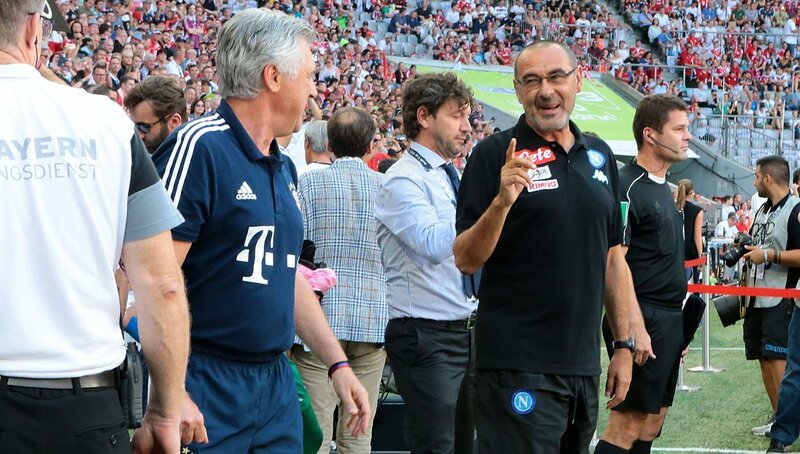 Former Chelsea boss and current Napoli boss Carlo Ancelotti has given tip to Sarri on how to deal with the texts. Chelsea chairman Roman Abramovich is a notoriously hard man to please. The Russian billionaire has been through over a dozen managers during his time at Stamford Bridge. Current boss Maurizio Sarri is now coming under pressure. One of the big names to be brought into the hot seat at Chelsea by Abramovich was Carlo Ancelotti. He managed the club for two seasons from 2009 to 2011. The legendary Italian won the double in his first season. However, he struggled to maintain his high standards the following season before being sacked by Abramovich. It appears that the 59-year-old was in no mood to give his former club any of his wisdom. Chelsea may have needed it at times this season with his Italian compatriot Maurizio Sarri coming under increasing pressure over team selection and performances. The west London club are amidst a race for the top 4. Rather than their pre-season title race ambitions and bright start to the season, it seems the Blues might finish outside top 4. However, Abramovich should be patient if he wants to have silverware. Pep Guardiola and Jurgen Klopp and Mauricio Pochettino all of them didn’t have a great first season but they had the backing of their respective boards. Abramovic should do the same with Sarri.